It’s officially fall and in a few days it’s Mehregan, the Persian Festival of Autumn. One of the things that I look forward to, when we enter the fall season, is drinking cups of warm tea regularly. The summer weather in Los Angeles in recent years has become less and less bearable, and as far as I am concerned drinking warm tea is not part of my daily routine. But let’s not talk about how it’s 81°F right now and focus on today’s fall related post! A few years ago my trusted acupuncturist, and friend, Dr. Sepi shared a natural remedy for soar throat went I visited her to get acupuncture while sick. The remedy was incredibly easy to make: Simply brew some lemon and fresh ginger slices in boiling hot water, then add honey and drink warm throughout the day. To this day, every time I have a soar throat I still make this simple tea and it really helps sooth my throat. 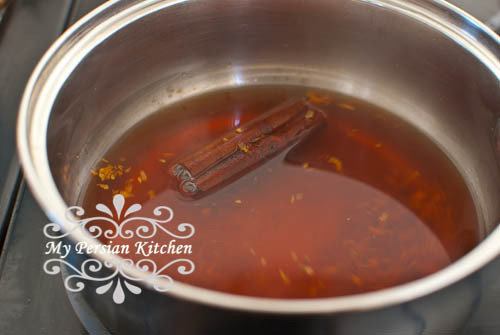 Not too long after, Dr. Sepi told me about a tea made with ground Turmeric, Ginger, and Cinnamon that she had come across. At the time this conversation took place the Western world was just becoming aware of the benefits of Turmeric. Since the recipe used ground spices I promptly went to my spice rack and excitedly prepared the tea. I took one sip and my first reaction was: YAK! I convinced myself to take another sip and thought about the excitement in Dr. Sepi’s voice as she said how much she liked the taste of said tea. I took a second sip. Lawrd was it awful!!!! I promptly poured the tea down the drain and went on with my business. As far as I was concerned Dr. Sepi could go drink her Turmeric Tea to her heart and health’s content! Moi? No thank you!!! Fast forward a few months, low and behold I came across fresh Turmeric at one of my occasional visits to Whole Foods. With much excitement I purchased a few roots and went about experimenting making Dr. Sepi’s tea with fresh ingredients. My what a difference. The tea was mild but good. 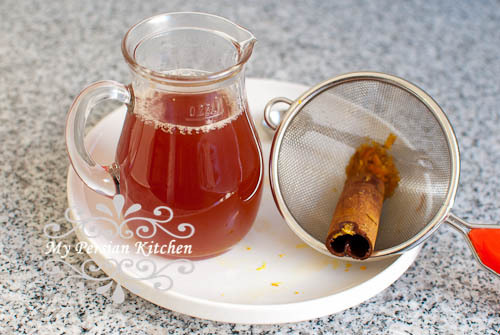 I recently did some extra reading about the benefits and preparation of Turmeric Tea. I made a small change that actually made the tea over the top good. Instead of brewing the spices in hot water for 10 minutes, I simmered them for thirty minutes. This made a huge difference flavor wise. The color of the tea changes dramatically and the flavors are very bold. Specifically, ginger adds an intense spicy flavor; I don’t know about you, but I personally like my food spicy, not my tea! Now you do have the option of using less ginger, but I found a way to mellow down the spiciness. I simply added some fresh squeezed lemon juice and the tea was perfection, in my humble opinion. One of the things that I really like about this tea is that the cinnamon stick adds a natural sweetness to it and you don’t need to add honey like a lot of recipes suggest. What I also found is that you can make Iced Tea with this recipe and it’s actually really really good, too!! Last but not least, I would like to thank the Western world for finally catching on to the wonders of the Eastern world. 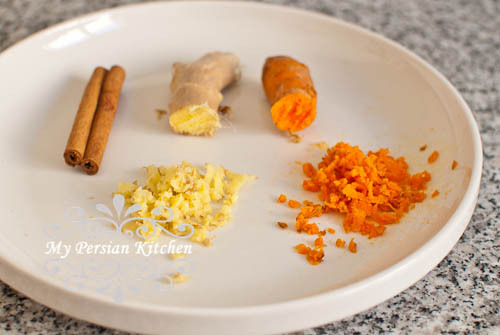 Place turmeric, ginger, cinnamon in a sauce pan. Add water and bring to a boil. Simmer on low for 30 minutes. Add lemon juice and half slice of lemon. 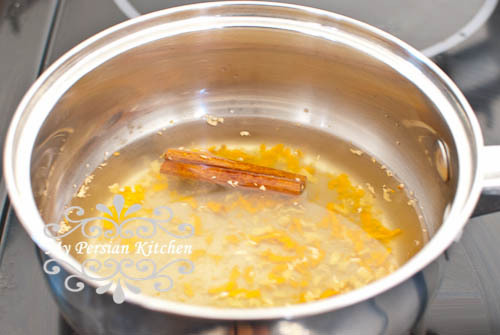 Now please see the recipes that a group of us Persian bloggers have created for Mehregan! Salom, merci for sharing this tonic. It sounds delicious, I shall make a flask for when I go to work on my allotment. How cool that you can find fresh turmeric in US. I still couldn’t find any of it here, in Milan or Florence. I don’t know about other cities but I never heard about it. 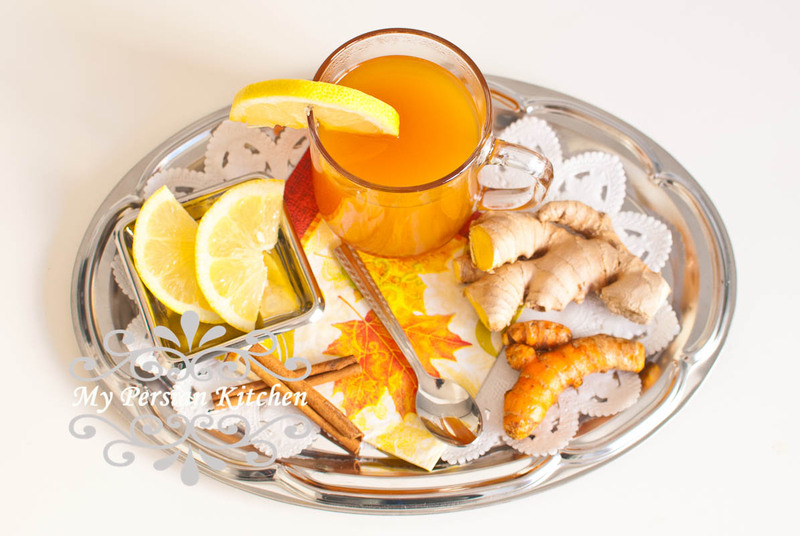 By the way I love turmeric & ginger and I am definitely will try your recipe, this winter. I love that you steamed it and how interesting the color of fresh turmeric after. wow. Thank you so much for this & Happy Happy Mehregan! Sanam joon, Your tea sounds heavenly…will definitely try it, thanks for sharing. As my middle child tells me, everything tastes better with lemon! I’m glad you came up with a turmeric tea that won’t make you gag. I have found fresh turmeric, but haven’t figured out what to do with it. I will have to try out your tea! Stay healthy! We are headed into summer in my part of the world – a very hot part of the world, too. I drink tea exclusively and love ginger so will be giving this a try – both warm and iced. Thanks so much for the inspiration! Sanam Joon, your post made me laugh so much. I feel you 100 percent! I also hate the taste of turmeric chai but I’ve never tried it fresh! I need to get on it. The first soothing drink you talked about is something I always have when I’m sick or just need a bit of a pick-me-up. These are amazingly healthy drinks and yes, thank you western world for the late catch-up for sure! P.S. I’ve been meaning to get acupuncture for years and never got around to it (that’s my excuse and I’m sticking to it, I guess). Do you like it? This tea is amazing. I have an Indian friend who swears by the medicinal qualities of turmeric steeped as tea when you’re sick. Oh this infusion is magical! Specially with lemon and honey, it’s a secure cure for cold. Bita, make this tea and tell me what you think!!! Yes, I do like acupuncture, most importunely, it depends on who you go to and for what.